Tacos al Pastor is very popular street food in Mexico City. 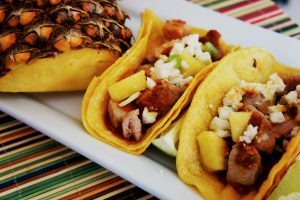 It is made with pork that is flavored with pineapple and ranchero sauce and served on corn tortillas. In Mexico City, a spit or trompo is used to cook the pork, but I’ve adapted the recipe for the backyard barbecue. Enjoy! Place the pork in a large mixing bowl and season with salt and pepper. In another bowl stir together the jar of Larry's All Natural Taco & Enchilada Ranchero Sauce and pour over the meat. Cover and marinate for two hours or overnight in the refrigerator. Remove the meat from the marinade and cook on a gas grill or charcoal cooker (or in a broiler) over medium high heat, basting with the marinade until the meat is cooked through, about 8 to 10 minutes. Meanwhile, heat the remaining ranchero pineapple marinade until bubbling for about five minutes. Remove the meat from the grill, chop into small pieces and cover to keep warm. Warm the tortillas on the grill, cover and keep warm. Layer two soft corn tortillas together and place a spoonful of meat on the top layer. Spoon the heated ranchero pineapple sauce over that, sprinkle with the minced onion, fold the tortillas in half and serve.